My athlinks.com profile results show that I’ve completed 18 foot races in the past 2 years or so. I’ve run others races but the results were never put online. 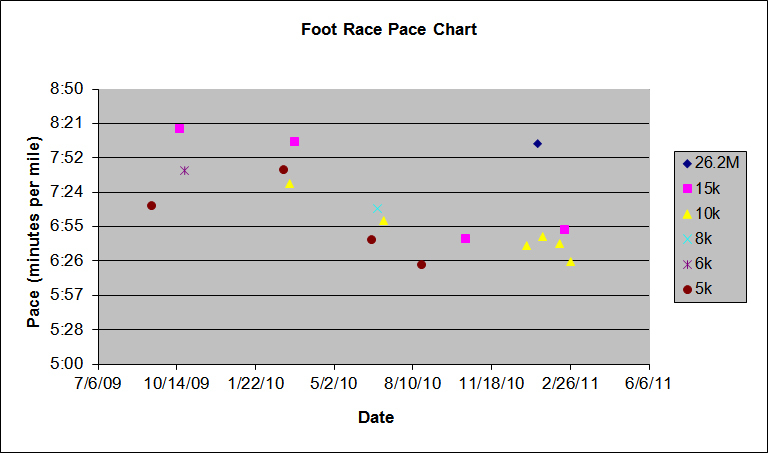 I used these 18 race results to chart my pace to hopefully identify a trend. The trend I hoped to illustrate was better race results. To create my chart I used Microsoft Excel 2003. I have Office Pro 2010 at home but I haven’t gotten comfortable using it yet. I started Excel and created a new blank worksheet to enter my data into. I formatted the cells in row “1” for Date (3/14/01). I formatted the cells in the data field for Time (13:30). To do this I selected the desired cells then selected Format, Cells…, Number, and the desired option from the main menu bar. I left the cells in column “A” formatted as General data which is the default option. In column “A” cell “2” and greater I entered the race Distance. In my case these were 26.2M, 15K, 10K, 8K, 6K and 5K. I chose to enter the longest distance at the top and the shortest at the bottom because my pace for the longer races would be slower and this layout made the chart easy to use. In row “1” cell “B” and greater I entered the Date of each race. 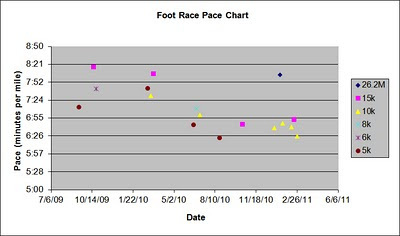 In the cells between the distance and date I entered my pace for each race in minutes and seconds on the appropriate row. After entering my data in the cells I selected all the columns and rows that I wanted to chart. To create the chart I selected Insert, Chart…, and chart type XY (Scatter), clicked a few more options, then hit Finish. The newly created chart popped up below my data. The program automatically assigns a different icon and color for each distance. I edited the chart by right-clicking the mouse on any of the 3 areas of interest and choosing the appropriate menu of options. The 3 editable areas are the plot area, chart area, and legend. Change the size of the chart by selecting the chart and dragging the edge to the desired size. There are probably many other options to chart races and training but this one seems pretty easy to me. After writing this blog I found a site called BreakingTheTape.com where users can log and chart their workouts and add this information to their Blog. I hope to review the features of the site after I've had some time to use it.